There is no message like the gospel…a message that shouts of hope and transformation for each and every person who “calls on the name of the Lord”. And people of faith must be mobilized by God’s Spirit to share it. But here’s the crux of the matter: Christ followers don’t need more condemnation…we need vision. To be blown away by God's presence and power, and to understand the unique calling on our each of us is the stuff that irrigates our souls with joy! Prayerful and thoughtful consideration of every request. Personal consultation with a member of Karl's team to help us in making your event a success. Promotion of your event on Karl's blog, broadcast media (as able) and social media channels. Presentation of liberating truth that fits the context and needs of the audience. Karl has been speaking publicly for over 30 years. His passion is that a spiritual revolution would happen inside the church that reaches the world. As Karl says. "I truly believe that the answers for all we face as a nation, rests in the hearts of God’s people – we need an awakening". Born in Alaska – the heart of rugged individualism. Raised by great parents and attended a good church – religious but not yet transformed by God. Completed the 1,100 mile Iditarod Trail Sled Dog Race at the age of 18 – shocked that he was still unfulfilled. Changed by God on Feb. 11th 1984 – brokenness is the place Karl was reborn. Received B.S. in Biblical Studies degree from Multnomah University in 1989 – blessed by God and received a vision for ministry and a wife (Junanne) for life. Coached a multi-racial track team in South Africa – convicted by God of legalism and compelled to reach all people. Launched two college/career singles ministries that grew rapidly and thrived spiritually – began to understand prayer and how God directs his people. Spoke nationally at marriage conferences with FamilyLife for 11 years – saw the pain of relationships and the power of God to heal them. Led a dynamic church that grew to be the largest in the state of Alaska. It was featured on the front page of the New York Times (Nov. 23rd, 2007) for its strategic outreach and innovation – witnessed the reality of the spiritual war and the power of the gospel to create a dynamic movement of people. Was a finalist for the 2014 National Religious Broadcasters Radio Program of the Year – confirmed how compelling the pure gospel truly is…it’s the hope of the world. New Morning Host, WMBI 90.1 FM, Chicago – believing God that "greater things are yet to come". Launched an new church on the near West side of Chicago, 180Chicago.church. – desiring to be on the front lines of a new spiritual awakening. The personal scoop on Karl is pretty simple. As he says, "I love my wife of 26 years, Junanne, and my son and daughter. I live in Chicago, Illinois and enjoy studying, traveling, hipper music than my age, good coffee and talking life-change." All the topics Karl speaks on are aimed at catalyzing tangible life-change the listeners lives. He will customize his presentation to meet your specific needs. Karl's goal is to facilitate the outcome that honors God and fulfills your vision/mission. Karl can fulfill most requests, but his most requested topics include the following. Keep in mind that he can present these in part or full in weekend church services, a keynote address, conference or a workshop. 180 One Day: This catalyzing event is intended to awaken a spiritual revolution within the church that reaches the world. ‘180 OneDay’ is offered to both medium/large audiences and as a training event for non-profits and church leadership teams. Our team can customize the event to fit your schedule and present it in conjunction with your worship team or guest artist. Provided with this event is fully produced presentation notes and personal notebooks for attendees. 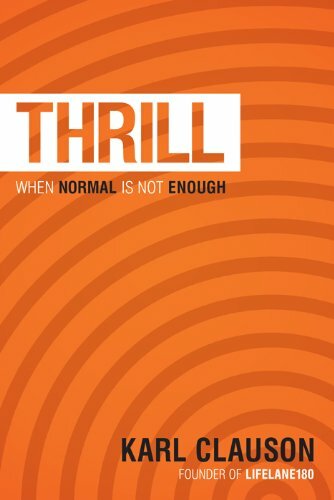 Thrill: The church is a mission field today. We believe millions of faithful church attenders have yet to experience life in Christ. This illusion of transformation is not only heartbreaking, it can result is a significant movement when hit straight on. Why Thrill? Because normal is not enough. Thrill doesn't ignore the challenges and trials of life, it leverages them. With compassion and vision Karl tackles the most critical issue facing every person….their heart condition and how God wants to give them sustained life transformation. FIRST: Men don’t need condemnation…they need vision. The potential in men is locked up in preconceived ideas of manhood that are flawed, small and diminish their ability to be truly great. Men who desire to be their best and dare to believe God for something beyond their imagination are poised for a new spiritual trajectory. In 'FIRST' Karl takes men through the lies they've believed and walk them into God’s greater vision and how God fuels us to walk it out. For more information on booking Karl for your event or church gathering please provide your information below. Please provide start time and end time.